On the battlefield, in the air, on the ground. In the most extreme and torturous environments. Our products are constantly punished. And they consistently perform beyond expectations. 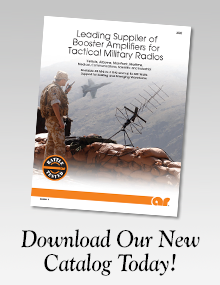 AR Modular RF military products are battle-tested, airborne-certified, and gunship-approved. They're simple to operate, smaller and more portable for troops on the go. They're completely dependable. That applies to all our broadband, sub-band, and discreet frequency non-EMC RF amplifiers and modules. The products we create for medical, scientific, manufacturing, and government applications result from the same innovative thinking and strict standards that drive our military products. There are no RF amplifier systems or modules that work harder, do more or last longer.